A number of City Departments will be present to answer your questions, including the Dept. of Water and Power, Sanitation, Department of Neighborhood Empowerment, and the City Clerk. 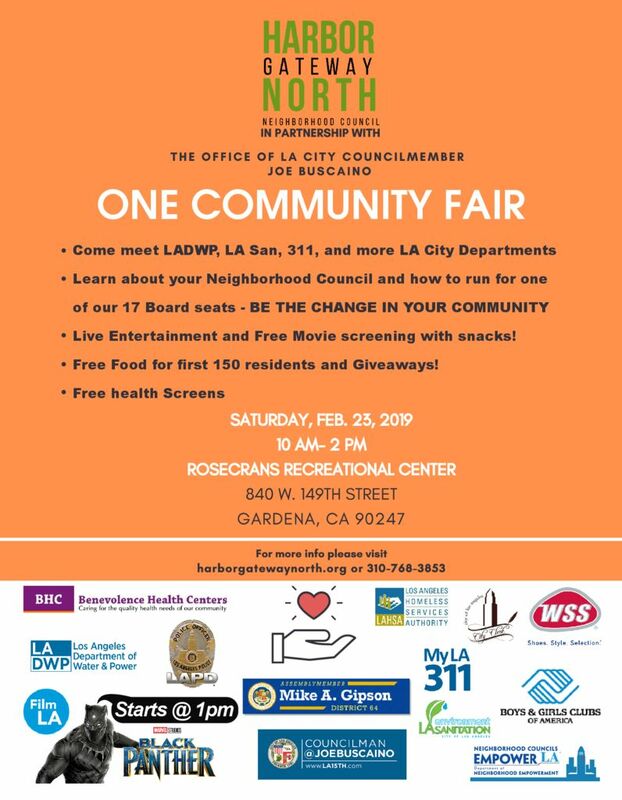 The City Clerk will be giving our information on the upcoming Harbor Gateway North Neighborhood Council Board election, which takes place on Sat. June 8, and will be signing up candidates who wish to run for one of the 17 Board seats. Free health screenings will take place in the Benevolence Health mobile van. Food trucks will give out free food to the first 125 who sign up and the movie “Black Panther” will be screened for free at 3 pm inside the gym with free snacks provided. Stop by our booth to say “hello” and to let us know what neighborhood issues are of concern to you.